AUGUST I. VAZZANA age 87. 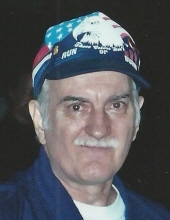 Beloved husband of the late Cleopatra (nee Despenes); loving father of Marie Banak (Mike) and Gus Vazzana Jr. (Tina); dear grandfather of Kim Banak; brother of Marie Babareka (John –deceased), and the late Antoinette Lijewski (Henry), and Marguerite Lampa. Passed away Tuesday November 13, 2018. Funeral Service Tuesday November 20th at 7:00 PM. in the McGORRAY-HANNA FUNERAL HOME OF LAKEWOOD 14133 DETROIT AVE. WHERE FRIENDS MAY CALL TUESDAY FROM 3-5 & 6-8 PM. Interment 11:00 am Wednesday November 21st at Ohio Western Reserve National Cemetery, Rittman, Ohio. In lieu of flowers, the family suggests that you bring a handwritten or typed memory to pin up, the funnier the better. "Email Address" would like to share the life celebration of AUGUST I. VAZZANA. Click on the "link" to go to share a favorite memory or leave a condolence message for the family.